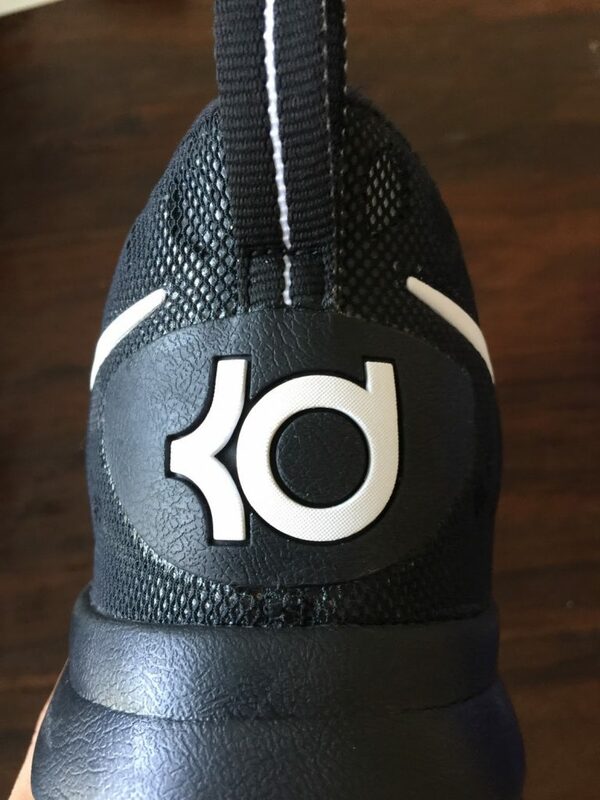 With Kobe gone, Kevin Durant gets moved up to first officer of the Nike Basketball’s ship (captained by LeBron James), a role he’s unofficially taken on the last few years since Kobe’s last few seasons were dimmed with injuries. 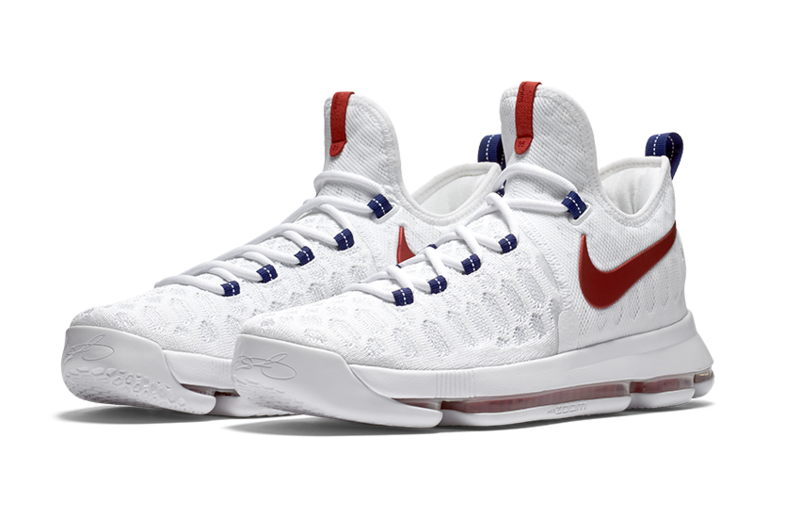 As the biggest name on USA Basketball in the upcoming Olympic Games, Durant will be the forefront of Nike Basketball this summer. 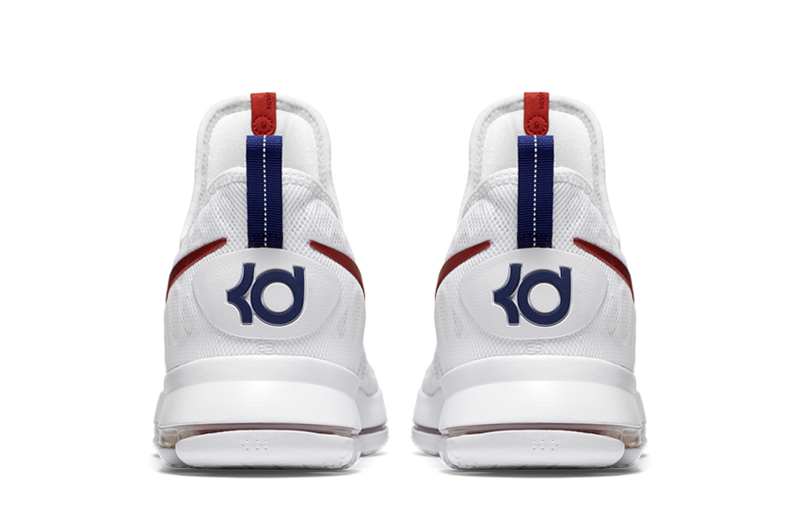 On Durant’s feet will be the KD9, the ninth in the series, which started out humbly as an $88 signature offering. 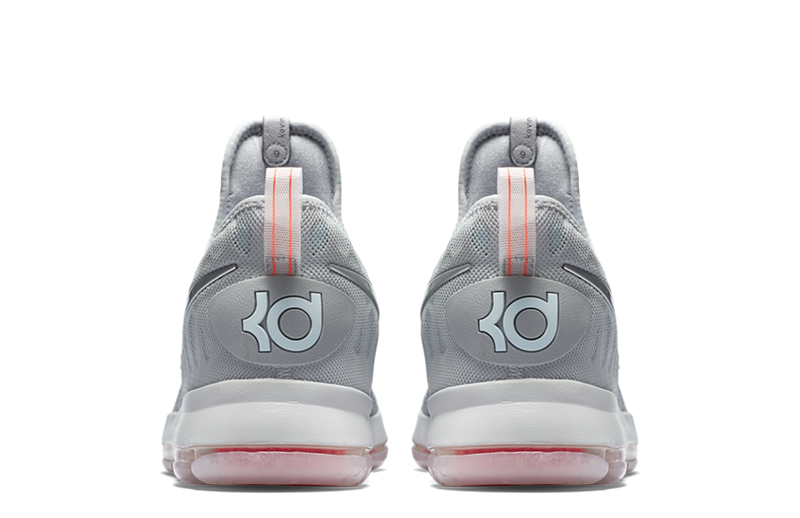 Eight 25-ppg-plus scoring seasons, an MVP and one big uniform change later, Durant’s signature shoe is a $150 sneaker boasting Nike’s best innovations. 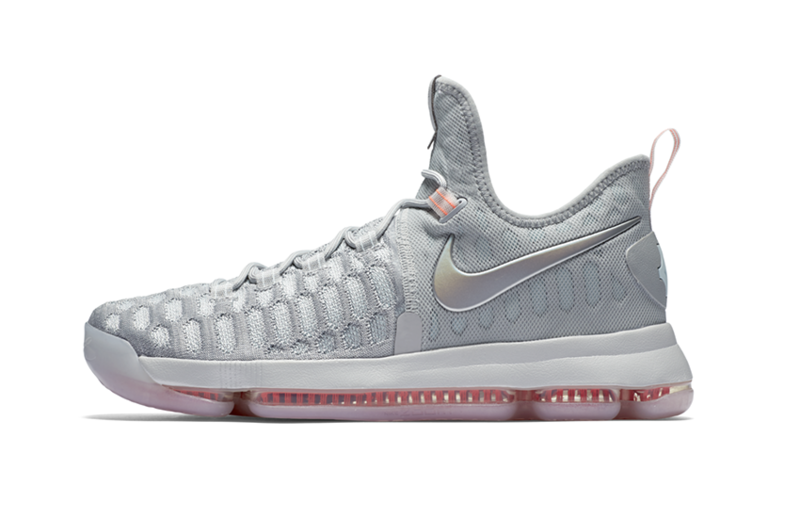 The KD9 outsole features a new-for-the-series honeycomb pattern that is made out of a very soft and pliable rubber. Visually, it is eye-catching and the honeycomb pattern is done with purpose. 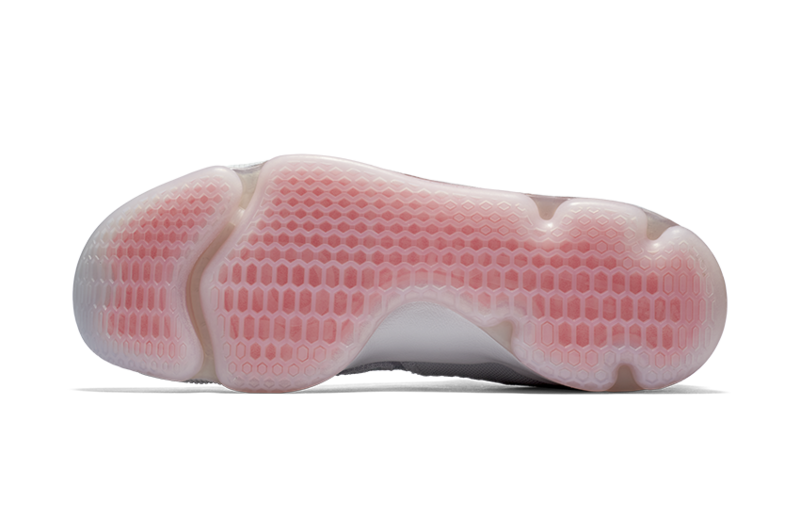 On the edges where court grip is paramount, Nike made sure to add extra surface area to those key spots with smaller honeycombs along with filling each one with a solid hexagon inside. 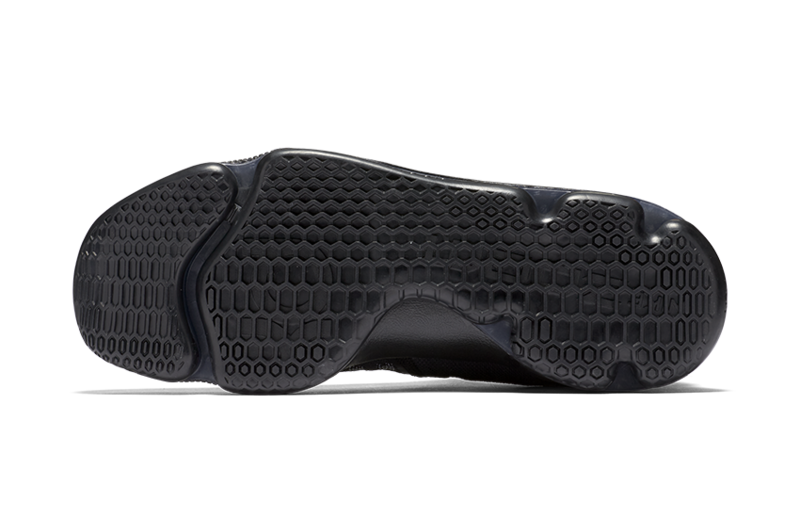 The forefoot of the outsole is separated with a fault line to give more flex to the foot. On clean floors, the traction is fantastic but on dusty floors, the outsole tends to pick up dust due to the rubber compound and the flatness of the pattern. Because of this, the KD9 needs to be wiped and wiped often to stay sticky. The revamped full-length Zoom looks very similar to the 360 Zoom featured on the LeBron X and KD VI Elite but with a few tweaks. The cushioning plays softer yet more stable. 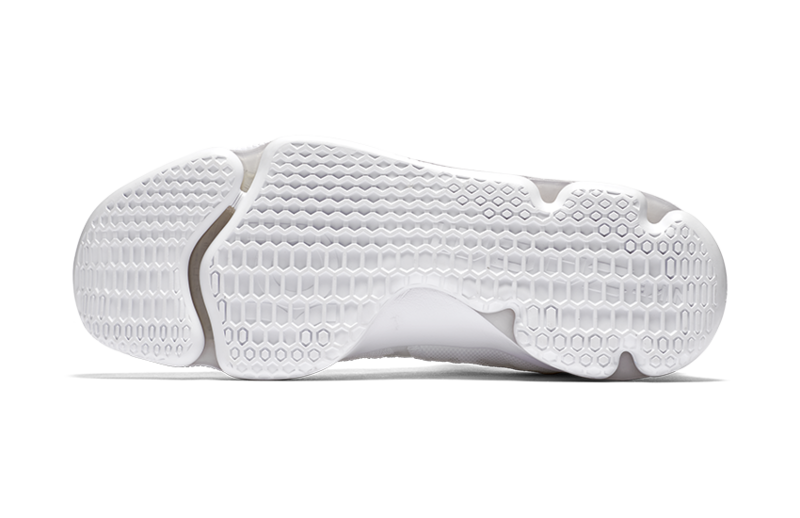 Nike reshaped the heel of the Zoom unit so that it doesn’t compress as much to help with stability on cuts and awkward landings. This prevents the Zoom unit from compressing and tipping over. 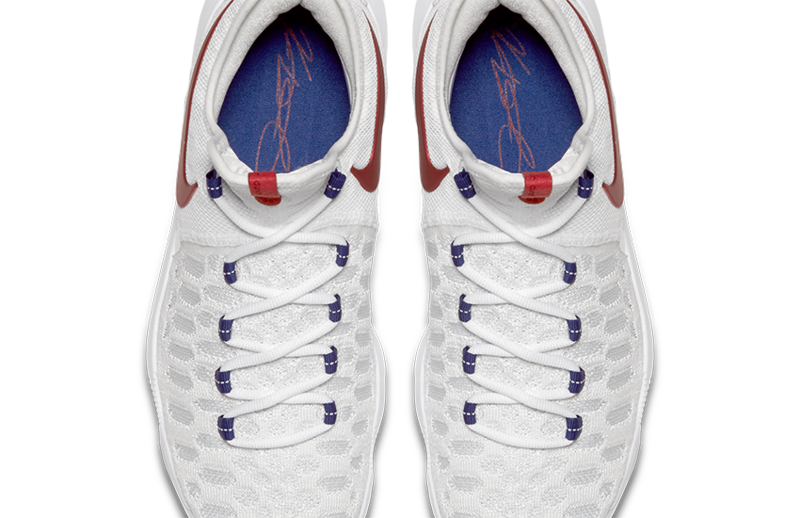 The forefoot Zoom is full articulated to allow more flexibility. 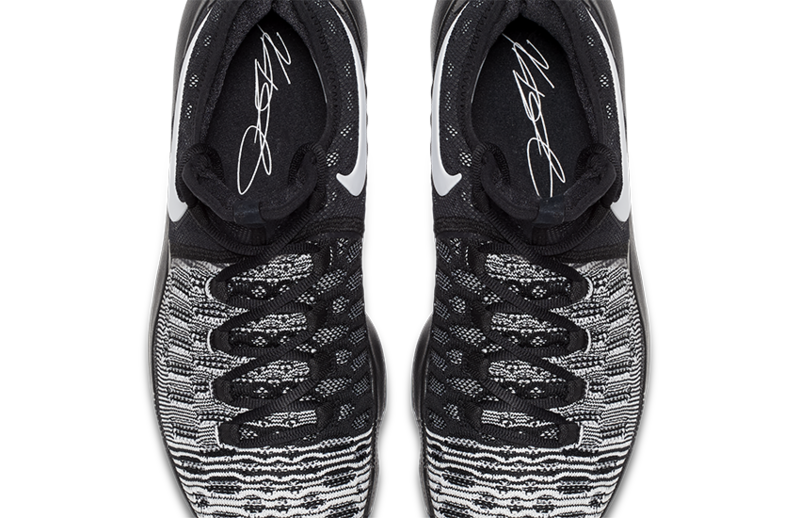 Nike also removed the pillars inside the unit and increased the number of tensile fibers to give the cushioning a softer more flexible ride. The sum is an addictive cushioning set up that feels fantastic underfoot without compromising flexibility or stability. 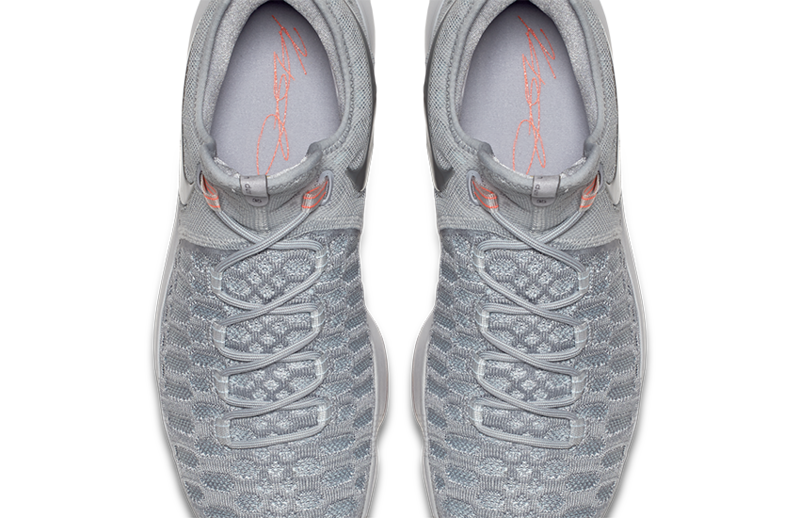 Knitted and woven uppers are all the rage and Nike gave the KD9 a true Flyknit upper in the front half of the shoe and mesh and foam in the rest. 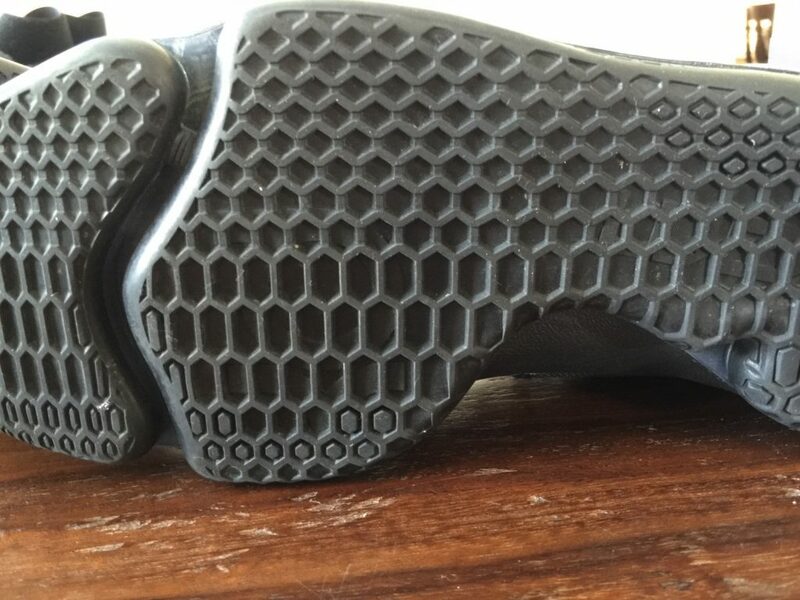 Rather than use shortcuts such as plastic or glue backing to increase strength, Nike used a honeycomb structure to give it strength where it’s needed while retaining flexibility in parts where movement is essential. The end result is an upper that truly conforms and hugs the foot like a sock. 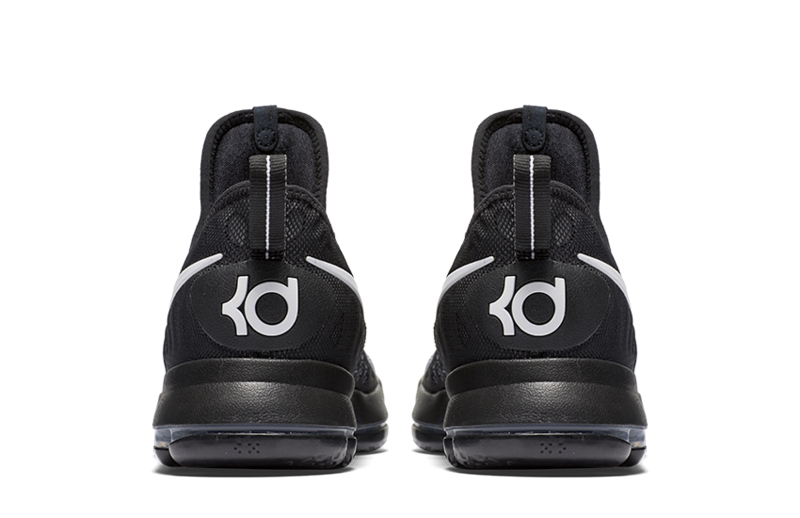 Of course, no shoe’s fit is complete without addressing heel slip and thankfully, the KD9 does a good job locking in the heel. It takes a few wearings to lock in the heel but once it’s locked it, you’re good to go. 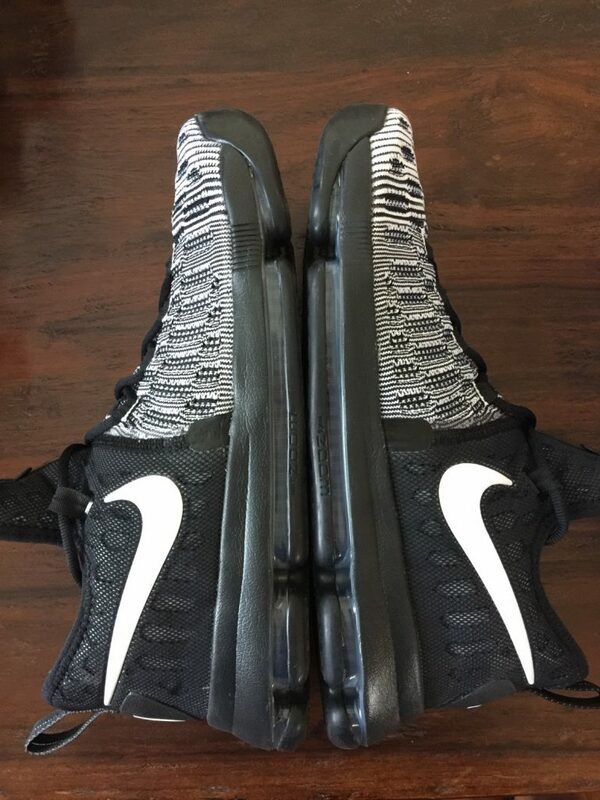 The KD9 runs a little long so if you have a regular or narrow foot, I recommend going down half a size. The shoe is a one piece upper so getting a fit with no bunching will be difficult. Wide footers can stay true to size. 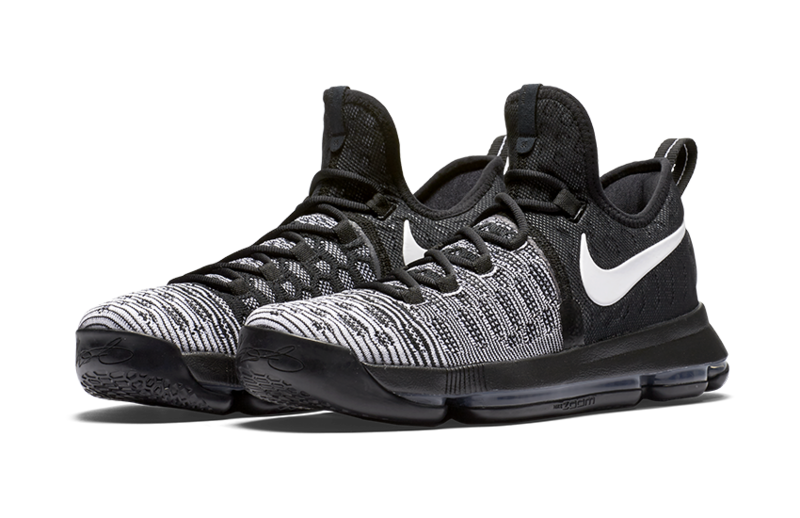 The KD9 is not the most supportive shoe on the market. It is a lower mid-cut shoe that supports the foot only with its fit and heel counter. 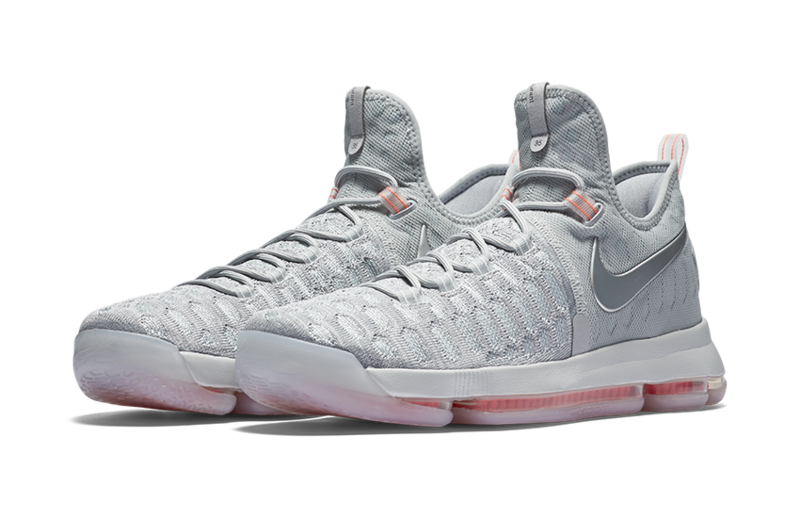 The main support on the KD9 comes from the Flyknit fit and the heel counter which is a bit flimsy. It does its job but it could have been done better. This shortcoming gets magnified if the proper fit isn’t achieved, so make sure you try the shoe on thoroughly beforehand. 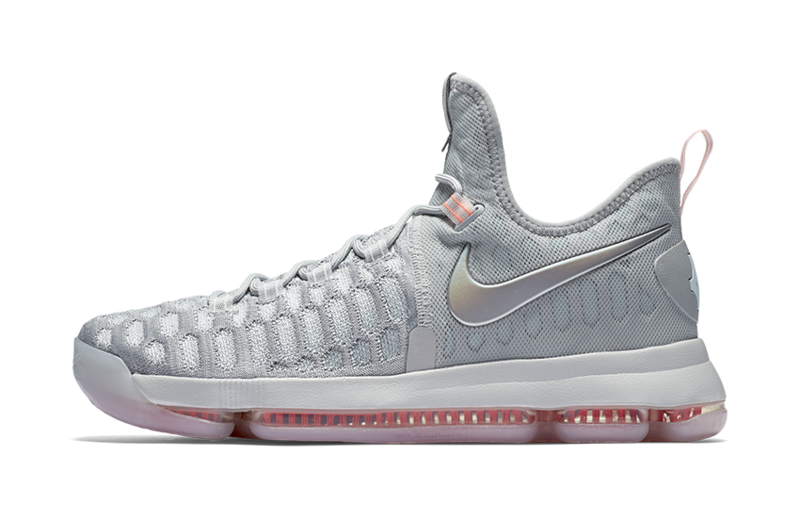 Despite the minimal support, the KD9 is stable underfoot due to the redesigned outsole and Zoom unit. 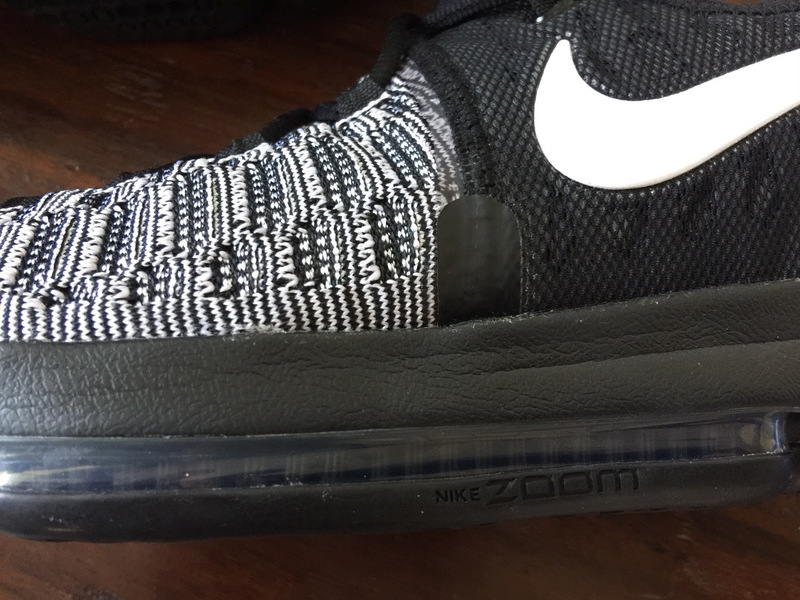 By reshaping the unit, the Zoom unit does not compress at the heel like the previous 360 Zoom. Overall the support and stability is good but nothing to write home about. 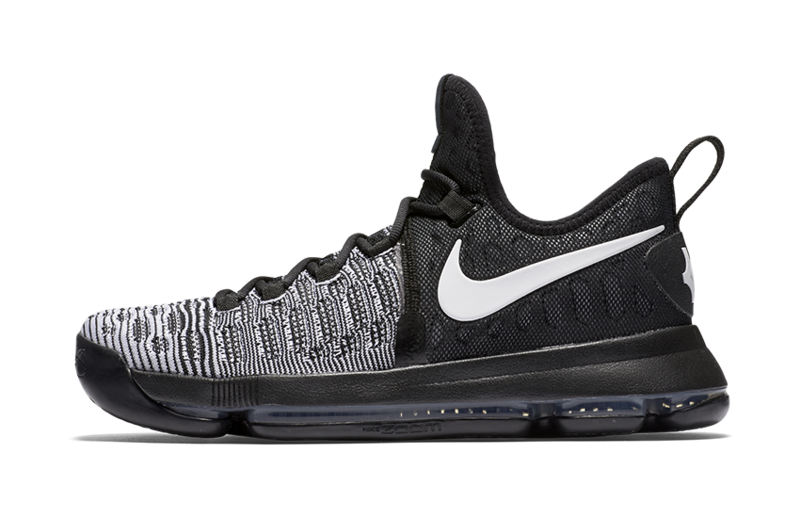 The KD9 does a good job keeping the foot on the footbed on hard cuts due to the honeycomb Flyknit upper. 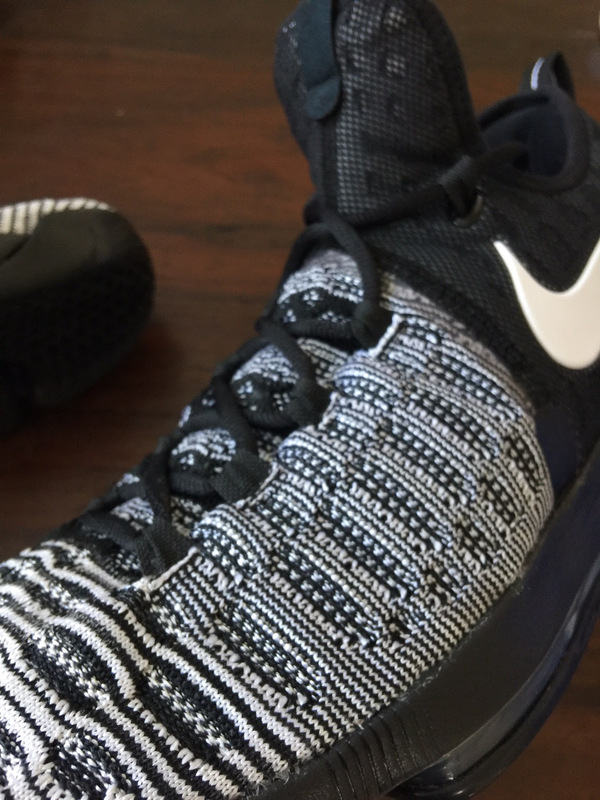 It could be better if Nike had raised the midsole a bit at the forefoot, but for a knit upper, it does a good job.